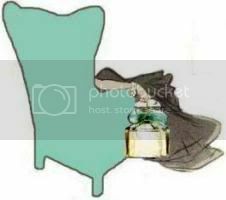 Created by Lynn Harris during her first pregnancy in an effort to wear a subtle and soft scent, Coeur d'été is the first fragrance from this line I have tried. Word from SA's at Saks Fifth Avenue suggests most Miller Harris fragrances are quite strong, a great asset for a fall and winter fragrance. Considering the fact that we are currently in the throes of summer in the desert, an unmistakeably harsher summer than most, and that my own senses are super sensitive right now, I am delighted so far with this one. Containing notes of chocolate bean, licorice, lemon, grapefruit, tangerine, banana, white pear, lilac, cassie, heliotrope, sandalwood, benzoin, vanilla and fruity musk, one would expect quite a gourmand fragrance. However, on my skin Coeur d'été generally qualifies as a delicate and soft, green floral. The top notes create a melange of greenery and fruit, with white pear, lemon and cassie holding front and center. As the fragrance dries, lilac and chocolate bean become apparent and their glorious interplay is worth singing about. This fragrance truly develops over time, and what remains on the skin after a few hours, while not long-lasting, is as delicate as baby's breath. It is important to remember that this fragrance was created to be soft and delicate, for it most certainly lacks any real depth with resonating base notes. Rather, it strikes me as ethereal, like a cloud hovering around its wearer, intermittently and ever so lightly reminding her of its presence. One could also compare it to angel's wings. Quite perfect for the heart of summer, indeed! It compares to another favorite of mine for summer, the dewy green Calvin Klein Eternity Summer 2005. The only downfall of Coeur d'été is its lack of longevity, for I certainly enjoy the first hour of wear, yet it seems to disappear within a few short hours. Again, another hallmark of a subtle scent. Overall, Coeur d'été is beautifully blended, a masterful merging of notes really. The notes as listed are deceiving so try this one for yourself to discover its light as a feather, soft floral fragrance. 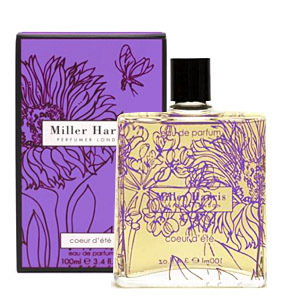 Miller Harris Coeur d'été is available at select Saks Fifth Avenue stores and online at luckyscent.com. A 100mL bottle retails for $120. 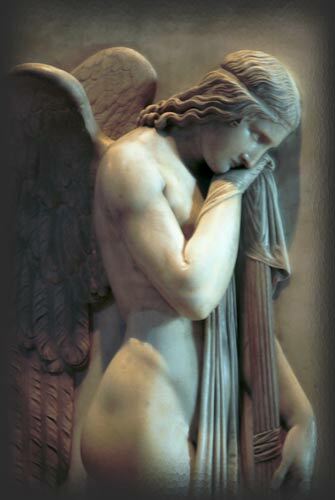 Image sources: luckyscent.com, angel statue from the Vatican - northstargallery.com. How are you? This sounds like it could be exactly the scent I am looking for. I am 7 months along now and thinking about a scent that might be appropriate for wearing with a snuggling newborn. Hope you are doing well :-)! I have a sample of this somewhere, it sounds beautiful. Wishing you the bestest of wishes, T! Thank you so much! This one is most certainly worth a try. Have a great day!